For those of you looking for the Joe Biden DNC 2008 Speech. What are NewTeeVee Pier Screenings? 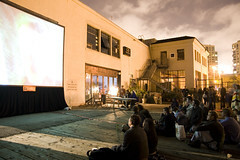 The NewTeeVee Pier Screenings, a series of four summer events, bring together content creators and online video aficionados in a casual setting. These events are live tests of how well online video survives the move from the PC to the gigantic screen, accompanied by entertaining commentary from our judges and informative talks by relevant, successful online video entrepreneurs. Past themes included episodic content, parody, product placement and user-generated advertising, and citizen news. This month’s theme is NON-HUMAN, by which we mean anything that doesn’t include human actors on-screen. We welcome animation, puppets, animals, machinima, or whatever other interpretation you have. Submissions will be accepted between August 1 – 21. The top six submissions will be shown at the live screening on August 28. This year the editorial team behind NewTeeVee and NewTeeVee Station will be choosing the finalists to be shown at each Pier Screening. Each event’s attendees (both in person and via live streaming) will choose the winner by text message vote. If you’d like to enter, please use this submission form. G-Technology will be giving 320G external harddrives to the top three winners as voted by the live audience. The first place winner will also receive a 1 terabyte harddrive and a free laptop engraving provided by Etchstar. 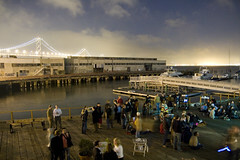 Etchstar will provide free onsite etching for iPhones and cell phones at the NewTeeVee Pier Screening. Just bring your phone and get it etched during the event. We’ll have a bunch of cool designs to choose from. If you are involved in the online video industry, or just love watching the newest web videos, don’t forget to join our Facebook group. We’ll keep you in the loop regarding cool events and tips from our editors. Click here to join us on Facebook. If you are interested in sponsoring the Pier Screenings, please contact us at [email protected]. If you have questions please contact [email protected]. As I’m writing this in my upstairs home office, workers from Alpha Construction are downstairs working on our most recent home renovation. This most recent phase will have them laying new floors, redoing ceilings, adding new recessed lighting and electrical outlets and of course painting. Amid all the construction, something occured to me. Nite On The Town members are in fact a community whose restaurant buying power has been aggregated, resulting in significant savings at local restaurants. Is it possible to aggregate our buying power in other areas to reap savings – eg home renovations? Alpha Construction (owner Baldo Coronado) has already done three projects for us over the last five years. He has updated our kitchen; redone our patio; remodeled our master suite and bathroom. We live in Orange Grove Village and were first introduced to Baldo by a neighbor.In doing our initial due dilegence we discovered that Baldo had done work for six different owners (multiple projects for some) in our complex over the previous ten years. We talked to these neighbors and saw his work. Everyone gave him glowing recommendations and the work spoke for itself. Like everyone else, our experience working with Alpha has been wonderful. Price quotes have been very fair and in every case he has done the work at or under budget. In several cases modifications were required to the existing work. Baldo returned, made the modifications to our satisfaction – at no extra charge. Here’s what I’m thinking. If any of you are considering home improvement work over the next year why not consider banding together. I’ve talked to Baldo Coronado and he is willing to offer very attractive savings on any multiple projects that can be coordinated into his schedules. If you would like to investigate furthur drop us an email. I’d be happy to answer any questions and anyone is welcome to pop in and inspect Alpha’s work for themselves. As Barack Obama launches the final phase of his campaign, we’re launching MoveOn’s biggest effort yet to help Obama win: A huge campaign to register half a million young voters in the states we need to win most. Ultra and Sub Notebooks Which one? I’m in the market for a sub-notebook computer. Rumors are circulating that Apple is coming out with a 12″ screen MacBook. I like the HP sub-notebook. Has a beefy hard drive and nice keyboard. Overall nice system for the price. Me and my wife already have a Mac and 3 Windows systems. My main Dell system a Latitude D610 is getting old, the drive is small and it is starting to slow down. I am leaning towards the HP. I thought I read that Dell was coming out with a sub-notebook, but on their site there is nothing there, maybe it hasn’t come out yet. After I do some research I will post some updates on my quest. Just saw an ad for RockAuto.com in the Los Angeles Times. Basically if you “Need Auto & Body Parts At Rockin’ Prices?” call Rock Auto. Visit the site at www.rockauto.com 1-866-ROCKAUTO or 1800-762-5288 they are located in Madison, Wisconsin, USA. They show an ad for an oxygen sensor for a 2003 Buick Regal at $15 less than the nearest competitor. AutoZone is nearly $20 more! included are NAPA, Advance, Checker, Schucks, Kragen, O’Reilly. These are regular prices at RockAuto. Next time I need a part I am going to give them a try. RockAuto is a limited liability company (LLC) founded in 1999 in Wisconsin by brothers Jim and Tom Taylor. The company name was derived from the Rock River near Madison, WI. Jim Taylor, President, is an electrical engineering graduate of General Motors Institute and a University of Chicago MBA. He has more than fifteen years of engineering, management, computer systems, and marketing experience at General Motors, Deloitte & Touche, NutraSweet and Pfizer. Jim enjoys doing things on the weekend like adding fuel injection to his 1977 Lincoln. Tom Taylor, Vice President Marketing, is an electrical engineering graduate of the University of Michigan, Wayne State University, and the Chrysler Institute of Engineering. Tom has more than ten years engineering and technical sales experience with Chrysler, Rockwell, US Department of State, and a computer start-up company in Seattle. He drives a 1979 Chrysler 300 which has been in the family since new. Sandra Taylor, Vice President Customer Service, is an electrical engineering graduate of General Motors Institute. She has more than six years of automotive engineering and computer systems experience at Pontiac assembly plants. Sandra drives a 1992 Dodge van when she needs lots of room to haul her four children. She drives a LeBaron convertible when traveling light. Looks like a good book to own. It is filled with tidbits about the top artists and music of the last 50+ years. Contemporary music and classic music. Hip hop to opera. 1, 000 Recordings to Hear Before You Die is filled with the best music you should listen to. The albums are listed by artist and include interesting tidbits of info about the recording and artist. FYE will be posting the bands store tour shortly and promo on their site. The best of PHP, MySQL, Flash and XML technologies, brought together at one low price. Southwest is cutting 200 flights nationwide. 6% of flights cut. Vons grocery stores is now limits coupons to $1 value. Following the lead of Ralphs grocery stores of doing the same limit. Mervyns stores which is in Bankruptcy is going to be closing many stores in California. Has borrowed over $400million to regroup and revamp best performing stores. Mervyns has been advertising deep discount sales which are starting today. Discounts of 50% or more on many items. I have a couple stores near my home, one in Monrovia and another in Glendale. Valid August 27 – September 1, 2008. Excludes prior purchases, new reductions, shoes, intimates and jewelry. Offers may not apply in select closing stores. Clearance and closeout merchandise selection and prices are not valid in the following Meryvns locations: Newark, CA; Antioch, CA; Irvine, CA; Livermore, CA; Foothill Ranch, CA; Napa, CA; Laguna Niguel, CA; Fairfield, CA; Huntington Center, CA; Canoga Park, CA; Palm Desert, CA; Thousand Oaks, CA; Village Square, AZ; Sparks, NV; Scottsdale, AZ; Carson City, NV; Southwest Las Vegas, NV; Boise, ID; So. Phoenix, AZ; Reno, NV; Ingram Park, TX; South Park Mall, TX; Odessa, TX; Lubbock, TX; Midland, TX; Northstar Mall, TX; Silver Creek Plaza, AZ. Reports that Borders will be selling less music or cutting it out completely out at many stores. Found a few places that sell the ink/toner sticks for the Xerox Phase 8560. Which is compatible with several other printers. This is not the OEM, which is much more expensive. I’ll give it a try and see how it performs. We will see. /chroot/home/fourinkj/svn-24/varien/lib/db.class.php : 62 Unable to connect to the database! There’s something going on with the site. Tonight is the Strut Your Stuff event in Santa Monica. Thanks to Andrew and the panel and presenters. I may do the presenter as one of my sites gets closer. This should be a good event. This is the lineup from the site. Learn to build a better internet company. Mixergy put together a panel of experts who will each teach a different element of web development. Nicole Jordan – Will teach you how to use PR to build your brand. Jackie Peters – Will teach you how to use social media to grow your business. Alex Funk – Will teach you how to use widgets to grow your audience. Sean Percival – Will teach you search engine optimization. In this option, you get on stage and show your web site. The panel of experts will give you feedback on how to grow your business. This is an incredible opportunity to learn from the best in the business, and to show your site to the tech community. If you don’t have a site to show off grab a seat and learn. Each expert will teach you a different web strategy and then you’ll get to see them demonstrate how to put their tools to use on real businesses. Save on your next trip, use the tools that travel agents are using. itasoftware – to get the best deal. Login as a guest and you can save some money you have to go to the site. More robust data.